Qualcomm Incorporated has announced that its subsidiary, Qualcomm Technologies, Inc., has introduced Qualcomm® Snapdragon Flight™, a highly optimized 58x40mm board targeted specifically for consumer drones and robotics applications. 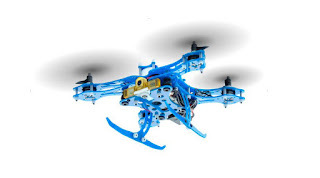 Qualcomm Snapdragon Flight is based on a Qualcomm® Snapdragon™ 801 processor, along with robust connectivity, advanced drone software and development tools, bringing cutting-edge mobile technologies to create a new class of consumer drones. "Today, drones are made from multiple component vendors providing separate solutions for photography, navigation and communications, adding to the cost and bulk of consumer drones," said Raj Talluri, senior vice president, product management, Qualcomm Technologies, Inc. "The Qualcomm Snapdragon Flight brings together the technologies that have defined the mobile industry onto a single board, enabling OEMs to build drones that are lighter, smaller, easy to use and affordable with long battery life and superior functionalities." Qualcomm Technologies also announced that Yuneec, a leading developer of consumer and professional drones with a long history of innovation in electric aviation, will be one of the first companies to embrace the Snapdragon Flight. Yuneec plans to release a drone based on the platform in 2016. "Drones are enabling a broad range of applications such as aerial photography, the ultimate selfie accessory and sports filming, so the ability to shoot in 4K is a must-have feature," continued Raj Talluri. "Qualcomm Technologies is already a leader in bringing 4K video capture to consumers having over 500 device designs powered by Qualcomm Snapdragon processors with 4K UltraHD video capability, allied with the highly integrated SoC, so it's natural for us to support the same technologies in the consumer drone space." The Snapdragon 801 processor powers some of the world's most popular smartphones and includes a 2.26GHz quad-core Qualcomm® Krait™ CPU, Qualcomm® Adreno™ 330 GPU, Hexagon DSP, dedicated video encode engine and dual image signal processors (ISP). Together, these form a heterogeneous computing platform to support the development of advanced drone features such as obstacle avoidance and video stabilization. Snapdragon Flight is available today for select OEMs, and is expected to be available in commercially available drones by 1H 2016. 0 comments on "Qualcomm Snapdragon Flight Supports Small, Light Drones with Advanced Video and Image Capture, Communication and Navigation Features"